My name is Anne, my partner of 32 years, Edie was aged 59 when diagnosed with Younger Onset Dementia, Alzheimer’s Disease in October, 2010. Worrying signs and changes in Edie gradually appeared from 2005. She started withdrawing, played computer games obsessively, stopped sitting and relaxing with me in the evenings and would only watch sports programs on TV. Edie was becoming increasing negative and ill tempered. She had always been a positive, calm and easy going presence. She no longer wanted to socialise. She admitted later she couldn’t follow group conversations and was frightened of repeating herself. She’d get defensive or angry if I tried to talk to her about my concerns. We had developed very healthy communication over our years together. We resolved issues and misunderstandings as they arose. We had no secrets, we had no need for them. Things had changed. Edie was no longer communicating with me. She wouldn’t tell me what was going on in her head; she didn’t tell me she was forgetting where to pick up her clients from for their driving lesson and that she was regularly going to the wrong house. Edie’s memory was one of her strongest assets. Her attention to detail and ability to remember names, dates, times and addresses was legendary. But now she was progressively disengaging and becoming more forgetful, frustrated, lethargic, defensive and negative, particularly at night. She’d unexpectedly get angry with me sometimes and walk off to bed. She’d accuse me of saying and doing things when historical memories came into her mind. She was forgetting about arrangements we’d made with friends and was increasingly leaving more to me to arrange holidays, shop, cook, and clean. We went on safari to the Kruger National Park in 2007, and to Vienna, Prague, Croatia and Norway in 2008. Unlike all previous travel, Edie didn’t get involved in any of the organising. She was still very keen to travel, but twice at airports when I went to the toilet, I found her lost and in a distressed state. She was leaving for work earlier and earlier. Fortunately she doesn’t have any memory of this period of time, because it was the most depressing, frightening and lonely time of our lives. Neither of us handled this period of our lives before diagnosis very well. Edie was blocking out everything and everyone, refusing to admit there was a problem and unwilling to share her fears, vulnerability and grief. I was getting increasingly concerned, frustrated and impatient with Edie. We were in unchartered waters withdrawing from each other as a way of trying to manage our feelings. It was horrible. A bank employee rang early in 2008 to say we were almost three months behind in credit card payments. Edie was an exemplary financial manager and I had left all financial matters to her. I found a mountain of unattended bills and financial documents on her desk and from that moment reluctantly inherited this role. Edie had many serious falls from 2006-2009; in one she fell and shattered her patella, only four months after a knee replacement. After it was wired we went on a planned holiday to North Queensland with friends. Although all this unfathomable stuff was going on and Edie was in a full leg brace and totally dependent for six weeks, we never at any point actually felt like giving up or stopped wanting to be together. Although we were not coping well at the time we are so grateful that in our darkest times, and there were many, our love for each other, though truly tested, remained steadfast and enabled us to go on. early in 2009. When I asked her what the doctor said, she said there was nothing wrong with her. I don’t know whether Edie actually went to the GP, or if she did and had forgotten to tell her why she was there. I insisted on us going together and from that moment Edie’s memory problems would get addressed and we could start to believe that maybe we could get through this terrible time. Edie underwent comprehensive neuropsychological assessment over several weeks in 2009, followed by appointments with several other specialists. We now attended all appointments together and Edie was no longer feeling or acting frightened or disengaged. Our open and honest communication returned. Edie needed me to initiate action and be with her. We needed to face it together. After a neuropsychological review in mid 2010 the neuropsychologist came to our home to deliver the findings, that significant deterioration had occurred in the 12 months, particularly in new learning and memory and this indicated the likelihood of Alzheimer’s. We sat in silence for a long after he left and eventually held each other and cried and cried in each other’s arms. The silent presence in the room was the previous experience we had with Alzheimer’s – my mother had died in 2005 after living with Alzheimer’s for more than 20 years. We had moved from Melbourne 23 years earlier to assist my father in her care and I became her primary carer after my father died in 2002. We already knew a great deal about dementia. The thought of me having to face this dreaded disease again had paralysed Edie and it was the main reason she shut down for so long and had so much difficulty in facing the situation and talking to me about it. Her motto was “If a thought is unbearable, it’s best not to think it and it’ll go away”. It didn’t work, because her denial and avoidance made our lives much more difficult than they needed to be. Edie must have felt guilty that she was going to be a burden and didn’t understand at the time that there was nothing for her to feel guilty about. I had to overcome a reticence to take command of the situation and not rely on Edie to make good decisions. A specialist neuropsychiatrist in Younger Onset Dementia confirmed Alzheimer’s in September, 2010 after a PET scan and a review of the earlier MRI. We now knew what we were dealing with; there was relief in that and a growing belief that we could launch ourselves to a better place, in time. It had been more than five years since I had first expressed concerns to Edie. The first two years were a maelstrom. Edie had to retire from the work she loved; we had to sell her car and business. There was a succession of new people entering our lives, local, state and federal bureaucracy, financial institutions, lawyers and organisations and agencies which support people with Dementia. The required form filling was unbelievable but thankfully Younger Onset Key Workers assist newly diagnosed families through the process now. We became actively involved in the Younger Onset Dementia world by participating in the three day Alzheimer’s Australia “Living with Memory Loss” program. It was a great experience for us and helped establish a small, local community of care and support with people in a similar position. Edie joined Alzheimer’s Australia Victoria Reference Group and Alzheimer’s Australia National Advisory Committee. She’d been on committees throughout my work life. A whole new world was opening up for us again and we were now beginning to feel more positive. We also commenced major renovations to our home which were completed within two years of diagnosis. It was stressful and inconvenient, especially when we didn’t have a kitchen, and then a bathroom, but it was worth it as it has made our lives simpler, easier and more comfortable. We also have a beautiful garden and a gorgeous 15 year old dog called, Shinji. We have lived where we live for 17 years; we both love our home and its location, and we plan on staying there for as long as possible. We’d be the first to acknowledge there are no short-cuts to truly accepting such significant change to our life circumstances, and that we didn’t handle things as well in the first couple of years as we do now. Edie once said, “I may as well be dead”. She can’t imagine ever thinking or saying that now. Love and good communication between us are the keys to where we are today. The support of significant others has also been necessary. We gradually learned to accept then embrace our new reality and the changes that happen along the way. accept our limitations and not have unreasonable expectations of ourselves or each other. We both had to face the awful grief, terrible sense of loss and fear of the unknown that comes with truly facing a new reality. We had to accept that the future we’d planned, of travel and retirement and long, lazy lunches with friends was not to be. But in facing the truth together it became possible to accept it and this brought with it a serenity and even deeper love and respect. We gradually became more relaxed, contented and good humoured. For more than five years now, since diagnosis, we have seen each other grow to a place of acceptance, contentment and peace. It’s not devoid of frustration and stress, but negative feelings soon subside because that’s not what we want our lives to be. We used to be so hard on ourselves, but not now. We choose to be on the side of life and we are grateful for what we have, and that helps us deal with our reality. We feel lucky in life and in love. There is no doubt that dementia is disabling, challenging and life changing, but there is much more to the story than that. We choose not to allow dementia to dictate our thoughts and feelings. We prefer to think about capacities rather than what’s lost. We have this moment in time and that’s enough. And for us, dementia has actually strengthened our relationship, brought us even closer and given us opportunities and experiences we otherwise wouldn’t have had. Love is at the centre of our lives now. Peace and calm descended on our household towards the end of 2012 and happily continues. I retired in June, 2014 and that has made life better for both of us. We enjoy spending time together, but we also have our structure and routines that gives us time apart. We look forward to the end of the day when we’re together again. We have been fortunate to travel to China, Botswana and Vietnam since Edie’s diagnosis. Edie will present a short film we made last year to an international audience at the Alzheimer’s Disease International Conference in Budapest this year. We acknowledge the importance of others in our dementia journey, people from Alzheimer’s Australia, from the Younger Onset Dementia community, couples and individuals who are in the same position as ourselves, and people who support people with dementia; special family members and friends who stay the course as well as professionals who assist us along the way. Our relationship is a very loving, positive and enjoyable partnership. We have known each other for most of our adult lives. We’ve had the most amazing life together. If marriage equality becomes a reality in the near future, we plan to honour our relationship by marrying in the presence of family and family. We advocate for marriage equality because we want young LGBTI’s to have the choice. We’re more playful and appreciative of each other. We embrace, cuddle and hold hands more, although we’ve always been very tactile. There is more tenderness, thoughtfulness, care and respect. We’re both wanting to be the best we can for each other. Edie is always saying, “I love you with all my heart.” We have never loved each other more, nor have we ever felt as loved. Edie doesn’t remember a lot, but we both know our deep love for each other. Love is not dependent on memory because love is a feeling. Edie says she has never felt more contented in her life. She doesn’t feel pressure, anger, frustration, fear or regret at all. She doesn’t have any bad memories. We are here for each other as best we can. Edie often looks at me and says she is overwhelmed and bursting with feelings of love and gratitude. And she just has to tell me again and again, how much she loves me. We are blessed. Intimacy and love continues to grow, despite dementia, we have both experienced deep personal and spiritual growth and healing. Together we are more than two. Edie describe us as “Team formidable”. 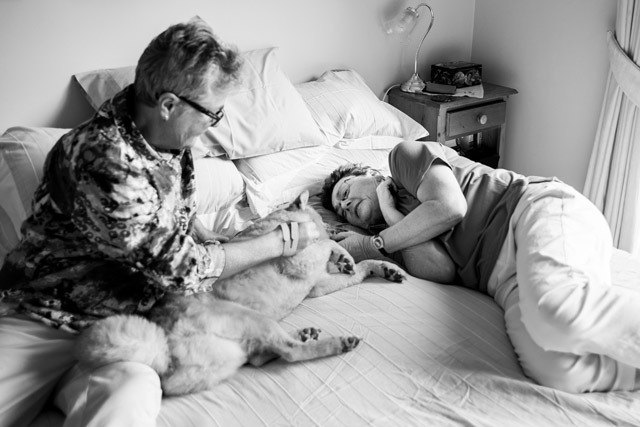 I am Edie’s staunchest ally, her fiercest advocate and beloved care partner. Edie, the love of my life, continually shows me her incredible love and devotion, is also my Teacher. Dementia is a terminal condition and love does not stop its progression, but love allows us to live out our lives together the want we want to for as long as we possibly can. Our wish is, whatever your life’s circumstance, your heart will grow bigger too.